What is Surf Fishing and Why Do You Need a Surf Casting Rod? What are the Characteristics of a Good Surf Casting Rod? For those that live in the coastal regions, ocean fishing represents a huge and exciting facet of the sport that inland anglers may only consider a rare treat. Fishing from the beach, known as “Surf-Fishing” or “Surf-Casting” is practiced on the coasts all over the globe. For this type of fishing, the idea is to get your bait or lure way out into the ocean, past the surf, a challenge not often faced by inland anglers. In order to achieve these great casting distances on the beach, surf fishing requires some additional specialized gear. Whether you are a seasoned angler of the surf or simply delving into it, we have a few tips on making sure you choose the right surf casting rod for the occasion. Surf fishing presents a new set of challenges from normal fishing scenarios. In surf fishing from the beach, casting distance is the name of the game. Because of the turbulence encountered in the surf break zone, fishing can often be fairly unproductive here and your lure will just get tossed around. To increase your odds, you need to cast out a little bit further near or past, the beginning of the break. This should be where more fish are hanging out. The problem is, on many beaches, that can be a far distance away, far too distant to reach with a conventional fishing rod. This is where surf-casting rods come into play. These are generally larger rods engineered to lob lures and baits long distances. In competition scenarios, anglers have achieved casting distances upwards of 500 feet! That is a pretty astounding number if you are coming from a conventional spinning rod setup. Obviously, this is the extreme upper end of the spectrum and an average angler should not expect to achieve this. However, with a proper surf-casting setup, you can expect to be lobbing lures and bait further than you ever dreamed possible. In order to optimize fishing from the beach, you need to reach out to the fish. To reach out to these fish, you are going to need a surf casting rod setup. Don’t get fooled into thinking that surf casting rods are strictly limited and specialized for saltwater, however. Big surf casting-style rods continue to be favored by many catfish anglers and other large freshwater fish commonly caught with bait. Having the strength and power of a surf casting rod to lob heavy and large bait way out into lakes and rivers is favored by many freshwater anglers. What makes a good surf casting rod? It basically boils down to casting ability. However, you there are other factors to consider such as hook setting ability and fighting power. To dial in the perfect casting and fighting setup, there are a number of factors you should consider before purchasing. A surf casting rod derives much of its distance casting ability from the generally longer lengths. Most surf casters are in the range of 9 to 13 feet. However, many agree that for a versatile and effective setup, a length of about 10-12 feet seems to fit the bill. 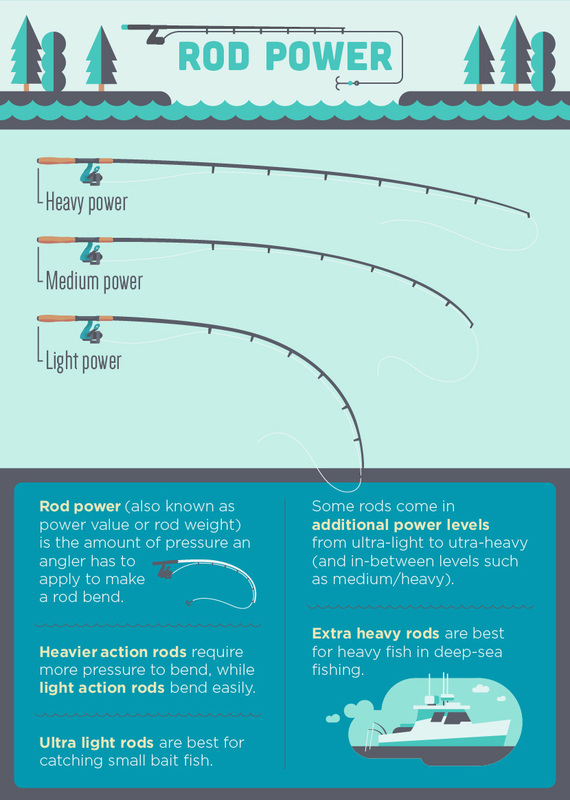 All fishing rods have a “power” or “weight” rating. They are generally rated from “light” to “heavy”. This rating generally refers to how stiff the rod is and is based upon flex per unit of weight. In surf fishing, you are generally going to be catching larger and more aggressively fighting fish than average scenarios. For a surf casting rod, most would recommend a “medium” to “extra-heavy” rod. Your final selection should be dictated by the weight of lures you intend to use and the fighting ability of your targeted fish species. Lastly, the rods rated “action” is a huge determining factor in the casting nature of the rod. A rod's action refers to the amount of flex that a rod experiences and where that flex occurs along to spine. Essentially it can be broken down like this. A slow action rod bends over the entire length of the rod and would be characterized as “highly flexible”. On the opposite end of the rating spectrum, a fast action rod bends primarily in the tip section of the rod. Generally speaking, for surf casting, you will be best off with a faster action rod. Whether you choose a “moderate-fast” or “extra-fast” rod will be up to you and your fishing style. The faster the action, the better hook setting ability. This may be favored for single hook setups. A slower action rod has a lesser ability to make quick and firm hook sets and may be better suited for a treble hook or bait setup. Now we're going to dive into the review portion of our article and take a look at the surf casting rods that made our list. Featuring the strength and durability of a solid carbon rod blank, the Fibilink Surf rod represents all that a good surf casting rod should be and nothing more. The guides are kept to a minimum number to reduce drag and are constructed of stainless steel and ceramic. This combination allows for durability and friction-free casting. The long rubber-coated handle is an optimal length for long and powerful casts. 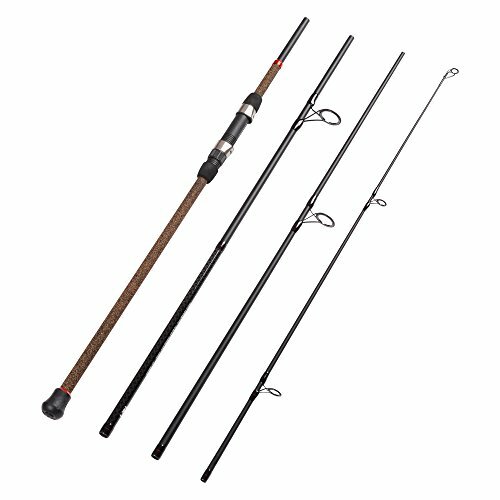 The rod is available in 10 and 12-foot lengths, both well suited for surf fishing and which also break down into two pieces. 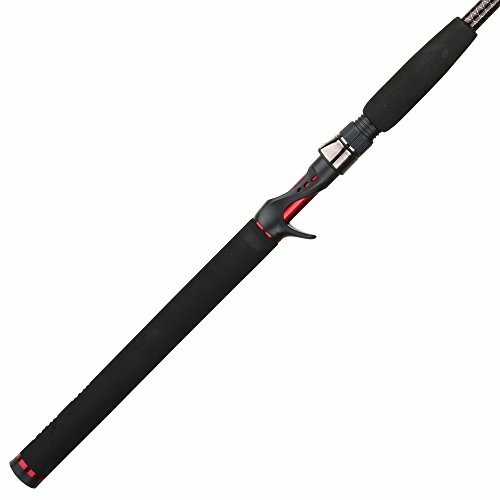 The rod is rated as a heavy power rod with moderate-fast action. All of which makes it a truly versatile casting rig. Across the three different options available, anglers can use up to 40 lb. line and cast lures or weights as large as half a pound. This is the perfect, no-frills surf casting rod. From the length to the action; it is all designed for a tough and durable rod that will cast way out into the surf. Giving anglers only a few options in length and weight rating, it is all optimized to be a versatile surf fishing rod. This lightweight, but heavy, fighting rod by TICA is sure to throw hard lures and baits long distances from the beach. The graphite TC3 rod blank is engineered with durability and performance in mind. The long cork handle features a lengthy grip above the reel seat as well gives anglers power and holding options to optimize their casting abilities. This line of rods has been designed to be lightweight and easy to carry for a long day on the beach. Despite their lightweight nature, buyers have options from medium to extra-heavy power options up to 12-foot in length. The rod is rated as a fast action rod to really offer good casting power. This is one of the higher end rods on the list and is backed up by solid user reviews. The available options in this rod are all optimized for an ideal surf casting rig. From the fast action to the long non-slip cork handle, to FUJI Hardloy ring guides; this is a high performing rod ready for the rigors of surf fishing. All around the world, anglers rely on the Ugly Stik name to serve their fishing rod needs for all sorts of game fish. Ugly Stik has built a name that is synonymous with heritage and reliability. The Shakespeare Ugly Stik Bigwater rod is designed for the requirements of surf fishing and big water casting. The Ugly Tuff rod blank is the same used on many other Ugly Stik rods, though this one is optimized for long distance casting. Available in lengths from 9 to 12 feet and medium to heavy weights, this fast action rod will deliver good long distance casting. The EVA foam handle is lengthy, as any good surf casting rod should be. The ultra-durable, “Clear-Tip” design found on many other Ugly Stik rods is also present on this rod, delivering durability on the delicate end of your rod and offers a visible strike indicator for bait fishing. This is the beefier version of your grandpa’s Ugly Stik fishing rod. Designed to huck lures and bait long distances, the long design and fast action are equally suited in the surf or throwing bait for catfish way out into the lake or river. Ugly Stik delivers a big performer with this rod that delivers all the Ugly Stik reliability in a surf casting setup. The Penn Prevail line of spinning reels is available in a wide range of sizes for a wide variety of fishing applications. Among this line of rods, is a selection perfectly suited for a variety of surf fishing applications. The graphite rod delivers strength, durability, and sensitivity needed for casting and fishing off the beach. The long EVA foam handle is optimized for a powerful stance and has a rubber grip on it to ensure a firm grasp. 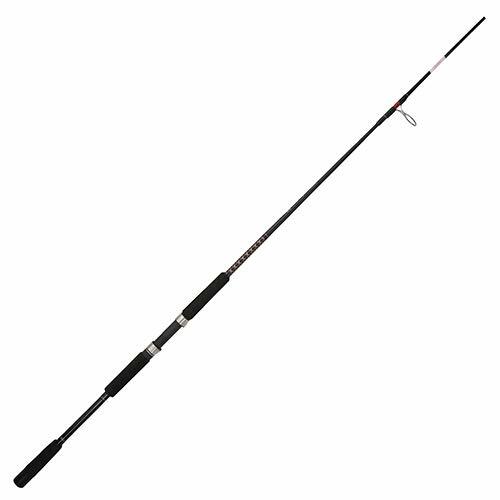 Available in lengths from 9 feet to 12 feet, this rod will be equally suited to saltwater fishing or big water freshwater fish. From medium to heavy, you can find a rod to suit your needs in this line. Equally at home casting deep into the surf or fishing for big river fish in freshwater, the Penn Prevail...well…prevails. Giving anglers a variety of sizing options, you can quickly put together a versatile or specialized setup for your specific needs. 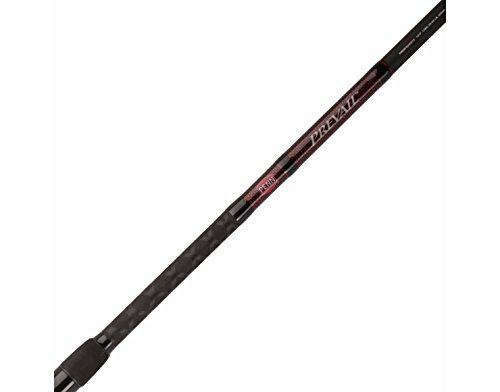 For a full-featured, surf casting rod with the ability to pack down to a manageable size, this rod by Fibilink fits the bill. This rod is very similar to other surf casting rods featured in our reviews. 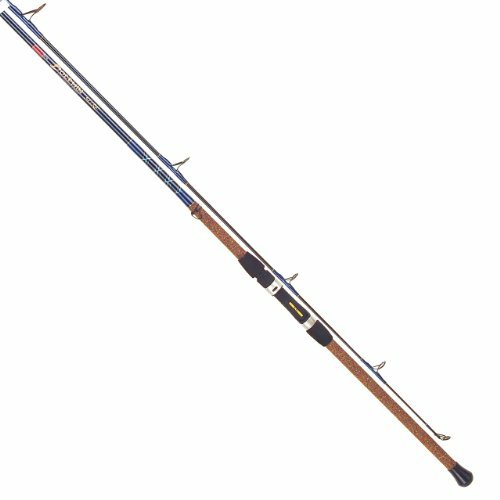 Available in lengths of 9 to 12 feet, heavy power, fast action, all make this a true and proper surf-casting rod. However, with many of the rods only available in one or two piece breakdowns, they can be hard to transport. Thankfully, this Fibilink rod delivers all that a good surf casting rod should, while still being able to break down into four manageable-sized pieces. The long handle on this rod ensures good casting form for long distance. The handle also features a rubber cork blend which gives the rod a nice look and great feel in the hand. Five guides that are a combination of stainless steel and ceramic, ensure optimal performance with reduced line drag to achieve longer casts. The carbon rod blank also maintains power throughout its life and is sure to be up to the rigors of regular and hard use of your fishing rod. For those wanting to surf cast, but in need of a nice packable rod, this may be your ticket. If you have a big trip planned and need to pack a surf-casting rod along, this is one that should fit in your suitcase. 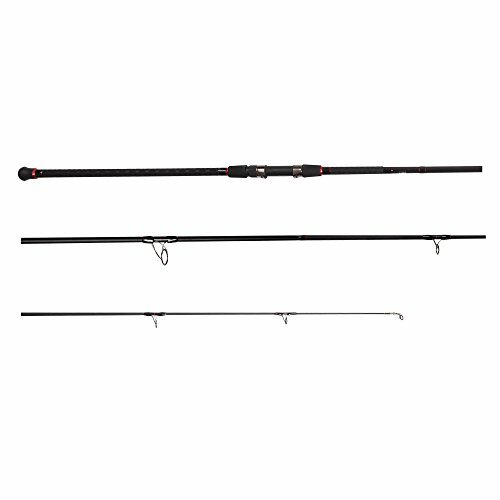 Despite it being a four-piece design, this rod maintains all the good characteristics of a proper surf casting rod. You should be able to rely on this rod to cast long distances for years to come. A surf-casting rod is inevitably going to be exposed to the highly corrosive nature of saltwater. Couple that with the effects of sand and grit grinding away the moving components of a reel and you have a rough environment for a fishing rod. After fishing around saltwater, you want to develop a regular habit of cleaning your gear. As the video shows, a properly cleaned and maintained rod and reel setup can look new and shiny for years to come. However, it takes work to achieve this. After a day of fishing, you need to get into a habit of rinsing off your setup. This is best achieved by a simple wipe down with a wet rag of your rod setup. One easy mistake to make is to use high-pressure water to clean salt and corrosion. However, DO NOT DO THIS. High-pressure water can easily push dirt, grit, and salt further into your rod and reel components, further exacerbating negative impacts. A simple wet wipe down should do. The video also discusses a way to remove any corrosion present on your gear. By using a simple spray-on furniture polish and light abrasive, you can remove the beginnings of corrosion caused by saltwater on your gear. Stay on top of cleaning and maintenance for years of reliability to come. Casting a surf rod with a spinning reel is really not much different than casting with any other spinning rod setup. However, to achieve the long casts necessary in surf fishing, it boils down to a few simple techniques. Though you may have a rod optimized for long and powerful casts, it won't do you much good if you can’t use it properly. The video above shows a quick demo for optimizing casting with a larger rod. With the long handle found on surf casting rods, some may not know how to handle the rod. You will want to grab with your dominant hand near or above the reel seat. Your non-dominant hand should grab near the end of the handle to give you more control. Like any spinning rod, you will need to open the bail and grasp the line with your index finger before letting it fly. Bringing your rod back nearly parallel to the ground behind you, lever the rod forward in a forceful manner, up and over your head. When the rod reaches just past vertical, you will want to release the line. With a little practice, you should be able to optimize your casting ability with your setup. A good cast boils down to a number of factors including rod, lure weight, the power of cast, and release point. You should now have a good understanding of what makes a good surf-casting rod stand out. Though functionally they are nearly the same as any other spinning rod, certain characteristics make it a true “surf casting” rod. Long handles, length rod blanks, heavier designs, and faster actions are all the traits of a true and proper rod for fishing in the surf. With a little knowledge, you can optimize a setup for your surf fishing. With a little practice, you will be effectively casting this setup long distances and pulling all sorts of fish out of the surf.